The demand to open up library systems through web services has been known for years (Breeding 2009). In particular, service-oriented architecture (SOA) promised to better allow a continuous evolution of library automation and to better connect with external systems. Nevertheless current library systems are rarely built of loosely-coupled parts that could be used independently. This reliance on monolithic systems results in a lack of open APIs to library services. Services provided by a library or similar institution should be easy to use by anyone and in any form. Most services, however, can only be used in the fixed context of a particular user interface (UI). If a service is also accessible via application programming interface (API), its functionality can be integrated and used in other applications, too. Unfortunately the need to expose services via open APIs is less obvious than UIs. User interfaces are curated and revised by usability studies and user experience (UX) at best. In other instances the UI is simply judged with common sense by normal library staff and management. APIs on the other hand, cannot simply be viewed, used, and judged by anyone. Unlike the UI, an API is not a final application to make use of a service, but the basis for creation of service applications: Without APIs, applications are difficult to build and services can only be provided in limited form. Without applications, however, it is difficult to justify the need for an API. The example consists of an application module “myApp”. This module defines a controller “MyController” to set a list of three bibliographic items in the variable “books” of a given scope. The controller is later used in the HTML body to display a sorted list of books with an HTML template. The template makes use of standard AngularJS directives (ng-repeat, ng-if) and expressions (| orderBy:'title', b.title, b.author). The application logic to create such a list could also be packed in a new directive to be used as a “widget” in multiple places. The practical embedding of library services in websites with AngularJS is illustrated in the following two examples. Both are available as AngularJS modules for easy reuse: the ng-suggest module provides access to search suggestions and links (Voß and Horn 2014a) and the ng-daia module provides access to availability information (Voß and Horn 2014b). Both modules are hosted at public git repositories with API documentation, examples, and downloads (https://gbv.github.io/ng-suggest/ and https://gbv.github.io/ng-daia/). The OpenSearch standard for search engines includes a specification for how to query search suggestions and autocomplete services via HTTP (Clinton 2006). 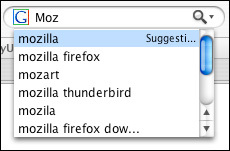 Suggestion services are provided by many search applications as “typeahead”. The method can also be used for instance by recommendation services (Voß 2008) and to support tagging with controlled vocabularies (Nagaya et al. 2011). Similar suggestions can be provided for any Open Search Suggestions service by just changing the service’s base URL. Among other features, responses can be embedded as simple lists (SeeAlso recommender services, for instance related documents and related publications), and other JSON response formats can be mapped to suggestions format. 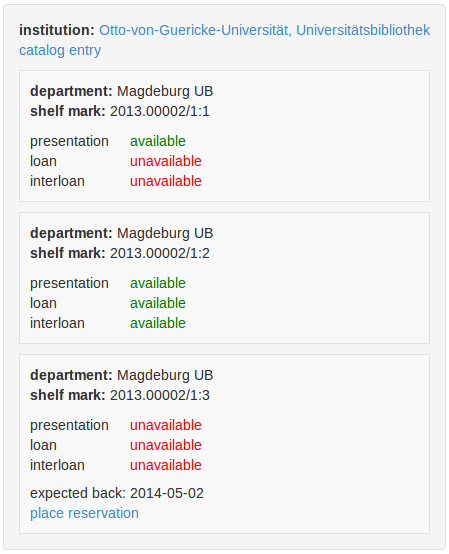 The full availability view as implemented in the default templates of ng-daia reflects the nested structure of DAIA data model, consisting of an outer layer for institutional and general document information, and specific information for each document holding (Voß and Reh 2014). The default template of directive ng-api uses another directive for the display of a holding item (daia-item) and its item template can be customized as well. Another directive is provided for the most compact display (daia-simple, see figure 5). DAIA Simple is a flattened, aggregated form of availability information that covers typical use cases, such as short display in a result list (see section 6.1 of the DAIA specification). The ng-daia module includes functions to transform from full DAIA to DAIA simple as well. All templates included in ng-daia can be customized with CSS. Localization for display in other languages is already supported with the popular module angular-translate (Precht 2014). Thanks to two-way binding of AngularJS variables, a simple statement such as $scope.language = 'de' can be enough to update the full availability display in another language. Despite efforts to open up library systems via standard APIs, for instance the ILS-DI recommendations (ILS Discovery Interface Task Force 2008), the support of library services via open APIs is rather low. If APIs exist (e.g. NCIP), they are often complex, vendor-specific, or available only for internal use. One reason for the lack of open APIs may be the invisibility of benefits and usage examples. The examples given in this article demonstrate how library services (e.g. search suggestions, recommendations, document availability) can be used easily once they have been made available via standardized APIs (e.g. 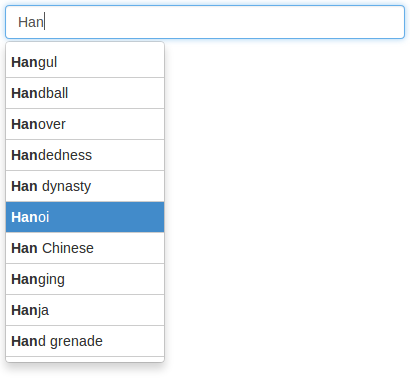 Open Search Suggestions and DAIA). Breeding M. 2009. Opening up Library Systems through Web Services and SOA: Hype or Reality? American Library Association. This article is based on the assumption that libraries actually want to facilitate the use of their services. In some cases this assumption might be wrong. All examples are available also as part of the article’s code repository at https://github.com/jakobib/angularjs2014/. We are currently working on the module ng-skos (https://github.com/gbv/ng-skos) to interact with authority files and simple knowledge organisation systems. One can also ask the vendor of library systems to implement standardized APIs to the core functionality of its product, but this requires some pressure by libraries as customers. Jakob Voß works in research and development at the head office of the Common Library Network (Gemeinsamer Bibliotheksverbund, GBV) in Göttingen. Moritz Horn studies information management at the University of Applied Sciences and Arts in Hanover.